Pouches, unknown maker, 1850 - 1900. Museum nos. T.102,103-1924. © Victoria and Albert Museum, London. Maedŭp is the Korean traditional craft of knotting which derives from the early practice of using knots in fishing nets and agricultural tools. The semi-lunar stone knife which was associated with rice cultivation during the Korean Bronze Age (1500 - 300 BCE) consisted of a slate blade with two holes where a finger loop was tied. The practical knot gradually developed into a decorative art form during the Three Kingdoms Period (37 BCE - 668 CE) and reached a peak during the late Chosŏn period (1392 - 1910). Traditionally maedŭp adorned all aspects of everyday life including sedan chairs, flags, portraits, musical instruments, clothing accessories, as well as household decoration in general. 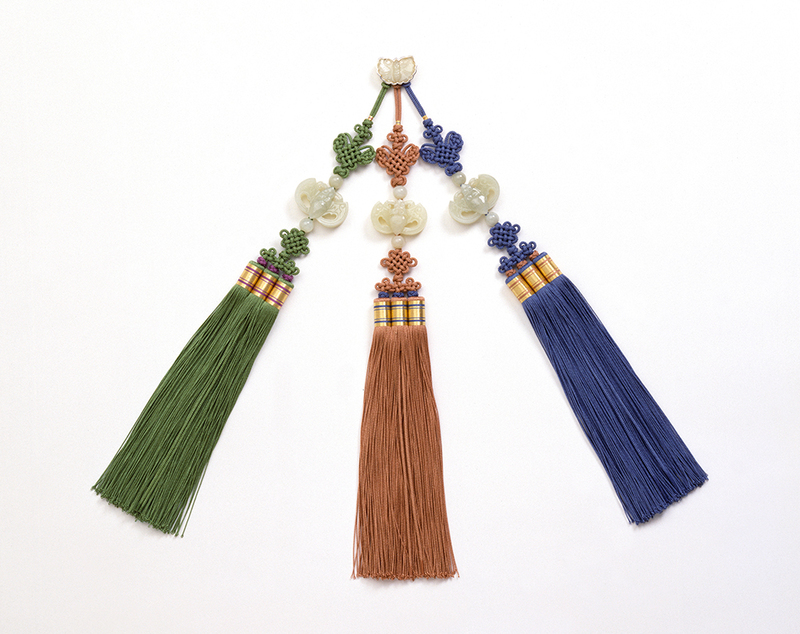 The combination of 38 knot types and nine forms of tassel produced a wide range of shapes inspired by nature and daily life, such as the dragonfly, lotus bud, chicken and the traditional Korean drum (changgu). 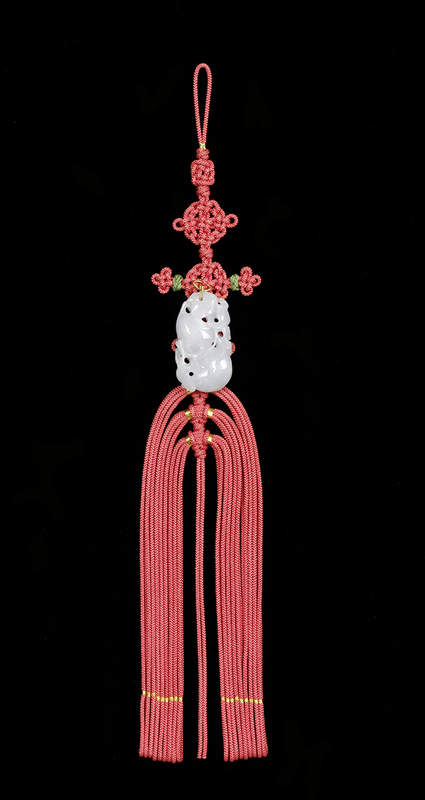 The V&A’s Korean collection holds several knot-craft objects, including pendants (norigae), pouches (chumŏni), a waist cord (sejodae) and an embroidered rear-apron (husu) which is part of an official robe. Embroidered rear-apron, 1850-1950. Museum no. FE.46-1999. © Victoria and Albert Museum, London. Waist Cord, 1992. Museum no. FE.546:1-1992. © Victoria and Albert Museum, London. The norigae is one type of the knot craft which allows considerable individuality. The word norigae means “a delightful object to keep and enjoy”, and pendants are indeed cherished family heirlooms that are handed down from one generation to the next. 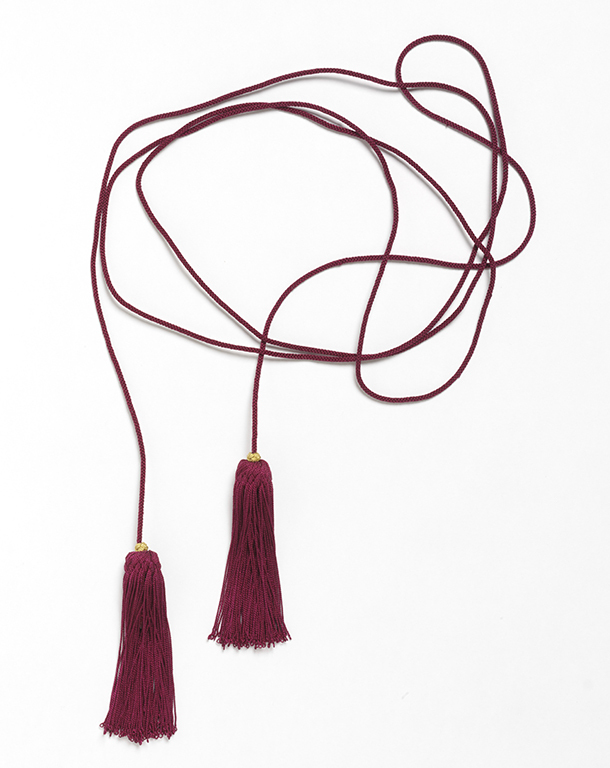 A norigae consists of three main parts: a hook (ttidon), a main ornament in the middle (chuch’e) and a set of cords, knots and tassels (tahoe). There are two main types of pendant, a single pendant (danjak) and a three-part pendant (samjak). The latter is further divided into three types depending on the size of the main ornament. The main ornaments of norigae consist not only of expensive hardstones, but also of hand-made embroidery and practical objects, such as a medicine box, needle case, and perfume container. The types of material of which they are made accord with the seasons. Cool materials, such as jade and beads, were used during the summer, while warm materials, including perfumes, were preferred for the winter. Apart from its decorative purpose, the norigae functions as a lucky charm that protects the wearer from misfortune. The shapes of the knots and the main decorative part symbolise the wearer’s wishes for fertility, long life and wealth. The V&A’s pendants with gourd or bat-shaped jades symbolise fertility and good fortune. The butterfly-shaped hook and knots, by contrast, allude to longevity, while chrysanthemum knots symbolise longevity and faithfulness. Norigae are worn by women with the Korean traditional costume (hanbok), tied to the sashes on the jacket or skirt. The origin of norigae is thought to be a pendant ornament (yop’ae) which was hung from a belt during the Silla period (57 BCE - 935 CE). As the woman’s jacket grew shorter from the late Koryŏ to the early Chosŏn periods, the waist ornament developed accordingly into a chest ornament. After the fall of the Chosŏn dynasty, norigae became obsolete due to the drastic modernization and westernization of Korean clothing. However the knowledge of norigae has remained today due to its transmission by a few inherited holders of important intangible cultural property. Pendant (Norigae), Kim Eun Young , 1991. Museum no. FE.427:1-1992. © Victoria and Albert Museum, London. Pendant (Norigae), Eun Young Kim, 1991. Museum no. FE.426:1-1992. © Victoria and Albert Museum, London. Sarah Milledge Nelson, Cambridge World Archaeology: The Archaeology of Korea, Cambridge: Cambridge University Press, 1993. Kyung-Ja Lee, Norigae: Splendor of the Korean Costume, Seoul: Ewha Womans University Press, 2005. Maedeup, Korean Traditional Knots: Aesthetics of Balance and Symmetry, Museum Member Society of Korea: Seoul, 2004. Eun-Young Kim, Kim Eun-Young: A Living National Treasure of Traditional Korean Knots, Seoul Gana Art Publisher: Seoul, 2003. Wilkinson, Liz. Birds, Bats & Butterflies in Korean Art. London: Sun Tree Publishing, Singapore, 1996.